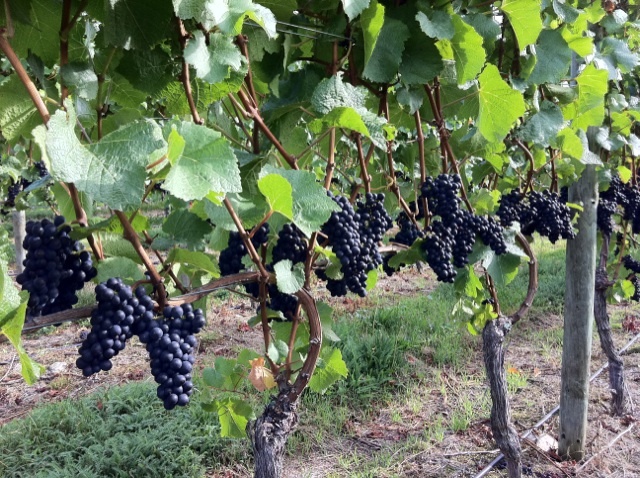 Grasshopper Rock Central Otago Pinot Noir | Vintage 2013 preview – how great? Vintage 2013 preview – how great? It is the end of March and already there is a lot of hype about the 2013 vintage in New Zealand with comments flowing like “best in 90 years” and “vintage of a life time”. Down in Alexandra at the southernmost vineyard sites we have not been quite so bullish. Up until now I have been sceptical about this vintage even being warm enough to fully ripen pinot noir grapes at Grasshopper Rock. While the rest of NZ has basked in a long period of fine and settled weather and the north island has been declared a drought area, we have been at the cool bottom end of the anticyclones. This means we get more cool southerly winds coming up off the Southern Ocean. The October to the end of January has been one of the coolest spring and early summer periods we have experienced. We ended up with mixed berry sizes, smaller bunches and some clones particularly late. As often happens in farming, bad months get balanced by good months and luckily February and March been outstanding in the vineyard. Some of the very best (hot & dry) late summer months we have seen. Finally I can see we could be heading for another good Grasshopper Rock vintage. Good because we are now on track for ripening the crop, bunches are smallish with nice variation in berry size and we have good crop levels. And the weather predictions for April are good. It is very hard to label a vintage from one vineyard “great” until a bottle is drunk, but it is clear that 2013 could add a very nice chapter to the Grasshopper Rock story and for this we will be grateful. This photo taken 28 March shows a perfect situation to be in a few weeks out from harvest.